We recognise that pupils learn in different ways and it is essential to provide them with a range of appealing learning opportunities which are purposeful and practical, providing a balance of activities which work to promote, extend and reinforce their learning. Pupils are taught as a class, in a group, individually and in small targeted groups when necessary. Because we have mixed age classes which vary in their make-up from year to year, we operate a four year rolling programme of themes. These are applicable across the whole school so that children can share learning opportunities together at home and across multiple classes. These themes have been planned in, however specific planning may alter as it is a child led curriculum and children’s interests will become evident and change over time. Should you as parents (or prospective parents) wish to obtain further information in relation to the curriculum, please do not hesitate to speak to either your child's teacher or Mrs Reeves, the Head Teacher. Learning in the Outdoors: We are very proud of our rural location and heritage and will always use the outside space as much as possible. Enquiry-based learning: We will always encourage children to raise their own questions about the world around them, and support them in finding answers (or further questions!). Reference to the school’s Local Community: Learning At The Heart of the Community and Britain as a whole is very important and so, we always aim to place a strong emphasis on our village and surrounding area in our learning so that the children develop an understanding of how our locality fits into their expanding view of the world. In our Theme Maps, the content shown includes coverage taken from the Key Stage 1 and Key Stage 2 National Curriculum documents. English – A lot of our Literacy is taught within our topic work. We acknowledge and value the role of parents and carers in nurturing their child’s language skills before starting school and continuing throughout their time in school. Literacy is seen as crucial for children to enjoy and develop in all areas of the curriculum. We place great emphasis on the need to speak clearly and to listen carefully and actively to others. Reading for enjoyment is seen as the key to developing successful readers. Sharing books in school and at home from Reception onwards is encouraged and we have a wide range of books to appeal to all tastes and abilities and a brand new library! All KS1 children and some KS2 children are given books from our reading scheme and a reading record book to bring home or teachers and parents to record any work in. We teach letters and sounds daily in 3 small groups in Class 1 and in catch up groups in Classes 2 and 3. Our letters and sounds teaching was rated as outstanding in our latest Ofsted inspection. Our cross curricular topics cover most subjects – Science, ICT, History, Geography, DT, Art and Music in a practical and inspiring way that imparts in the children a thirst for knowledge and a real interest in the world around them. We try to develop enquiring minds and develop the children’s skills in problem solving, observation, communication, prediction, interpretation, investigation, analysis, evaluation, creativity, self expression and much more!! Religious Education and PSHE are taught as standalone subjects as are Maths and PE. Maths -The school offers a range of mathematical activities in all areas. We recognise the value of practical work, investigations, calculator based activities, computer skills and mathematical games. Applying mathematical skills and knowledge to real life situations is vital and we endeavour to make the learning of mathematics meaningful and enjoyable emphasising the need for mental strategies and enabling children to solve problems in a variety of ways. 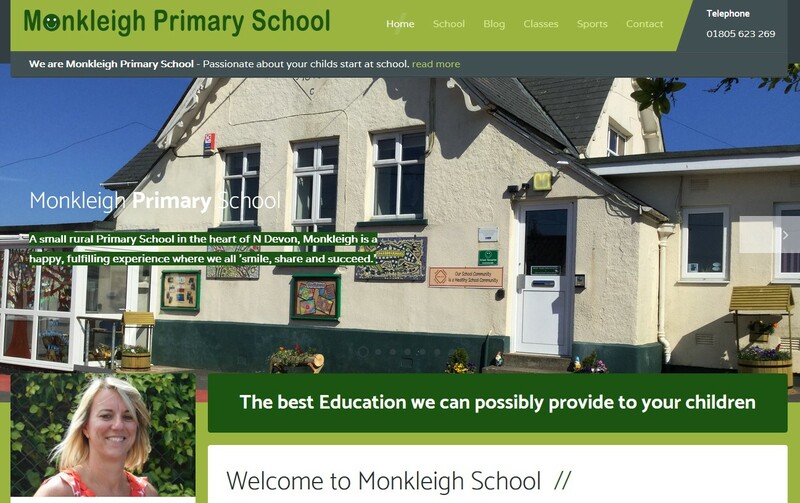 PE - We have an excellent reputation for sport at Monkleigh (please see the separate sports page for more information) All children receive at least two hours of quality PE each week. Opportunities are provided for children to participate in swimming, athletics, football, high 5, tag rugby, kwik cricket, cross country and many more.